YHC used to frequent Uptown Funk two years ago, used to dread it since running parking deck completely knocked the wind out of me. So much so that I remember pep talking myself into posting there. Since then my schedules have changed with morning bible studies or getting kids up in time for school, and before I know it two years had passed by. Out of the blue Brite Lite txt’d me if I can substi-Q for him, and knowing he’s going to funeral I was more than happy to help. As I prepared for Uptown Funk, all those fond memories came into mind, of watching sun rise during 6MOM on top of the parking deck, or balls to the wall near the courthouse hoping my partner would come relieve me asap. Good times. Such nice weather of 61C, GSO experienced a week of spring weather and alas as I write we are back to winter temperatures. One man came in hot and it was decided to SSH to wait for him, however he came in so quickly the Q omaha’d the SSH before even begin. It was awkward but the Q preferred to warm up on top of the deck. PAX climbed up the nearby parking deck for the real warmarama: SSH, cotton pickers, and Sun Gods. Then ran down to the bottom for THANG 1. THANG 1. Bataan Death March, a Indian run except the last man performs 5 burpees before running to the front. Oh, also up and down the parking deck. Started in one line, but it was taking too long for everyone to enjoy the burpees, two lines were formed. Ran up and down parking deck. 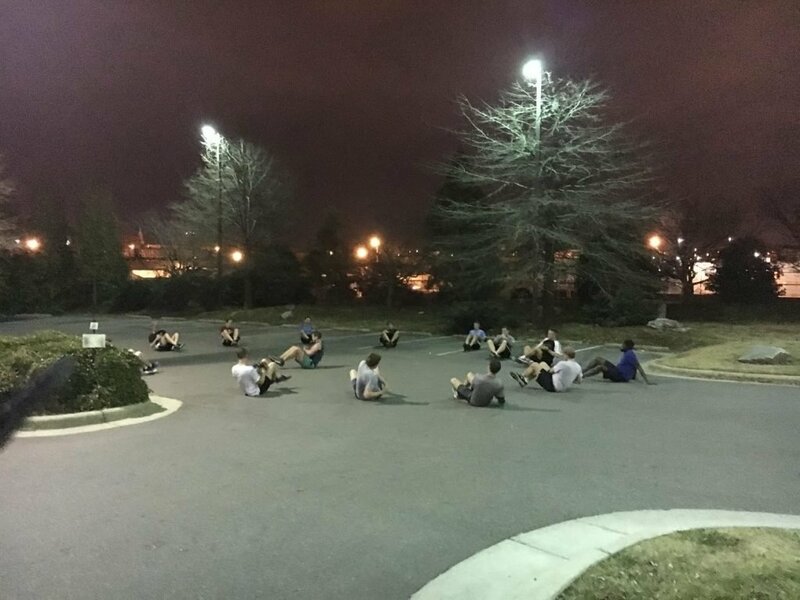 Next came the Indian bear crawl, two lines bear crawl up parking deck in Indian run fashion. We crawled up the ramp, then ran the rest of the level, and finished level 3 before mutiny ensued and Q ordered pax run up to top. Q had prepared for mutiny by level 1. This looked very hard on paper, and some incredulous faces could be seen. However when PAX worked as a team, we accomplish far more than what we could do individually. Are you a Patriot Fan? Only Drysdale ran, rest of us did burpees. Are you into watching sports? Everyone except Q ran, Q did lunges. Q was sure there were someone indifferent with sports! Do you post 1stF 3 or more times a week? Half of guys ran, the other half did imperial walkers. Have you posted 2ndF before? Half ran, other half did merkins. Have you posted to 3rdF before? A few of us ran, the rest did plank jacks. Also overheard a story over EHing to 3rdF coffee, nice! Do you like watching superhero movies? To Q’s amazement, the majority did say yes, however quite a few said no and did squats. Questions were opened up to the PAX, and Square asked two questions, one was have you filed taxes yet, and surprisingly Nomex actually did. He ran alone. MOM of American Hammer led by Earhart. Q asked pax to keep Lite Brite in our thoughts and prayers, read a quick description of his grandmother. Explosion recently went into back surgery. Q kept it lighthearted, yeah some thought the Indian bear crawl was crazy, but there were much bantering and laughter during the THANG 2. A fun time.